began with that question. Some of the answers came from Tom Piggott (my first electronic music teacher, and the one who got me started with analog synthesizers—an EML200 and an Arp2600). More answers came from Alan Pearlman, founder and president of the ARP Synthesizer Company, the man who commissioned my first symphony, Three Soundscapes for Synthesizers and Orchestra. Still more answers came from Dexter Morrill, who offered me a Visiting Composer’s Residency at Colgate University, where I made my first computer music. It took days back then, but I rendered ‘‘Happy Birthday’’ in Music10 and played the rendered soundfile for my dad over the phone on his birthday. Csound. By his side, I was able to further my understanding and to share some of the answers I had found along the way through The Csound Book. ing, and sometimes sailing. It was from him that I learned the programming language C. We would spend days and days going over every single line of his Conductor and Improv programs, his Scanned Synthesis program, his PhaserFilters program, and his Music V program. 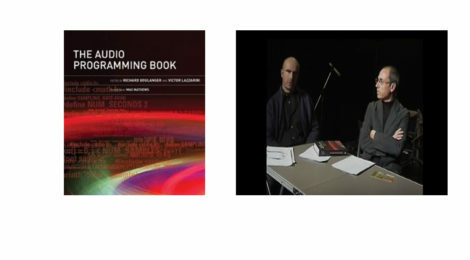 But still, it took John ffitch, Richard Dobson, Gabriel Maldonado, and Victor Lazzarini to teach me to actually ‘‘program’’ an oscillator—right here in The Audio Programming Book . 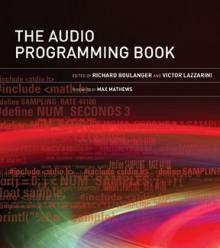 Yes, for me The Audio Programming Book answers my first question and many others. I think you will agree that ffitch, Dobson, Maldonado, and Lazzarini are wonderful teachers, and that the other contributors are their ‘‘young apprentices.’’ I hope the book will answer all your questions and will raise new ones too.